In some countries, customers are required to enjoy their food as the way as it is cooked; however, in Thailand it is freely to add anything in your dish as much as you want. For Thais, the condiments which can be seen in restaurants and food stands are as much as important to the food, especially for noodle dish. The four common condiments for noodle dish are sugar(1), fish sauce, chili vinegar and ground dried chili pepper(2). 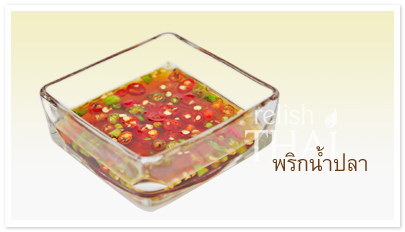 Chili vinegar will be seen widely as sliced(3) or pounded(4) Thai dragon chili marinated in vinegar, although only wonton soup will be added by sliced chili vinegar. Not only dragon chili will be marinated in vinegar, some people prefer to put sliced/pounded garlic or Thai chili (Bird’s Eye Chili) in vinegar together with dragon chili to bring out the flavor. 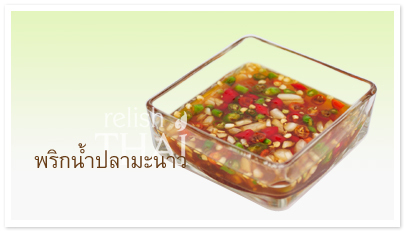 Moreover, in a condiment caddy you will sometimes see grounded peanut which is used for Tom Yum noodle (spicy and sour noodle) and Pad Thai noodle. 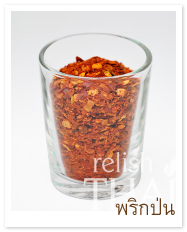 Another common condiment which will be seen a lot on every table also in a house is Thai fresh chili in fish sauce (Phrik Naam Plaa(5)). 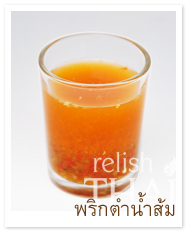 This is popular relish on Thai table. 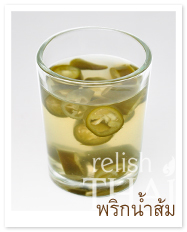 Thais like to add the relish in many dishes. With some chopped garlic and some lime juice, Prik Naam Plaa Manaau(6) is a great relish for a dish like fried fish. 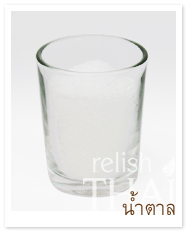 The eating habit of Thai people by adding too much condiment might be strange to foreigners, especially adding sugar to noodles. Some people add around 2-3 tablespoon of sugar to their dried wonton so it is turned out to be wonton in syrup. However, not only Thai food which you will see this habit, ketchup or chili sauce is also important to Thai people when they eat pizza. Therefore, you will not be surprised seeing ketchup on a table in a pizza restaurant outside Thailand because Thai customers bring it themselves.